Magnetic fields are one of the most challenging astrophysical phenomena to both observe and simulate. Although we see signatures that magnetic fields are everywhere in the Universe, they are often very weak and challenging to characterize in detail. For example, the Milky Way is host to a magnetic field on the order of 10-6 G, nearly a million times smaller than the Earth’s magnetic field. We know magnetic fields exist on galaxy scales and larger in the Universe, but we don’t know how they got there, and we don’t completely understand their role in how our Universe has evolved. In order to help constrain current observations on the strengths of magnetic fields in the early Universe, and possibly develop new signatures of what the original “seed” magnetic fields were like, the authors of today’s astrobite use cosmological hydrodynamics simulations (or magnetohydrodynamics, MHD) to study how various magnetic field strengths in the early universe influence galaxy properties today. Simulating the effects of magnetic fields accurately is very challenging, and usually involves making many approximations. For this reason, many simulations do not include their effects. However, if magnetic fields have a dramatic effect on galaxy evolution, it may very well be important to understand them in detail in order to understand how galaxies actually form in our Universe. In addition, their effect on galaxy evolution, as explored through simulations, may provide strong predictions and unique observational signatures that can tell us more about the origin of large scale (galaxy-wide and even larger) magnetic fields in our Universe. Although the magnetic fields that permeate the Universe are very weak compared to our every day experience, they can have dramatic effects. Magnetic fields act to supply pressure to whatever gas or plasma they reside in; that is pressure in addition to the thermal pressure of the gas. Just as gas pressure, or thermal pressure, is generated from the kinetic energy of molecules within the gas, magnetic pressure comes from the energy contained within the magnetic field that exists within the gas. Our current observational and theoretical understanding is that magnetic fields were seeded in the early Universe, by some uncertain mechanism, that had strengths on the order of 10-9 G (and maybe even smaller), a factor of 1000 less than those currently observed in galaxies. As galaxies formed and the gas within them was compressed from an initially more diffuse state, the magnetic field strength grew over time. Depending on its initial strength, the extra pressure from magnetic fields during this process could have dramatic effects on how many galaxies form, the distribution of galaxies, and how stars form within galaxies. Using analytical arguments, the authors show that seed magnetic field strengths around the level expected (10-8 – 10-9 G) contribute enough additional pressure to the gas to play a major role in galaxy evolution. 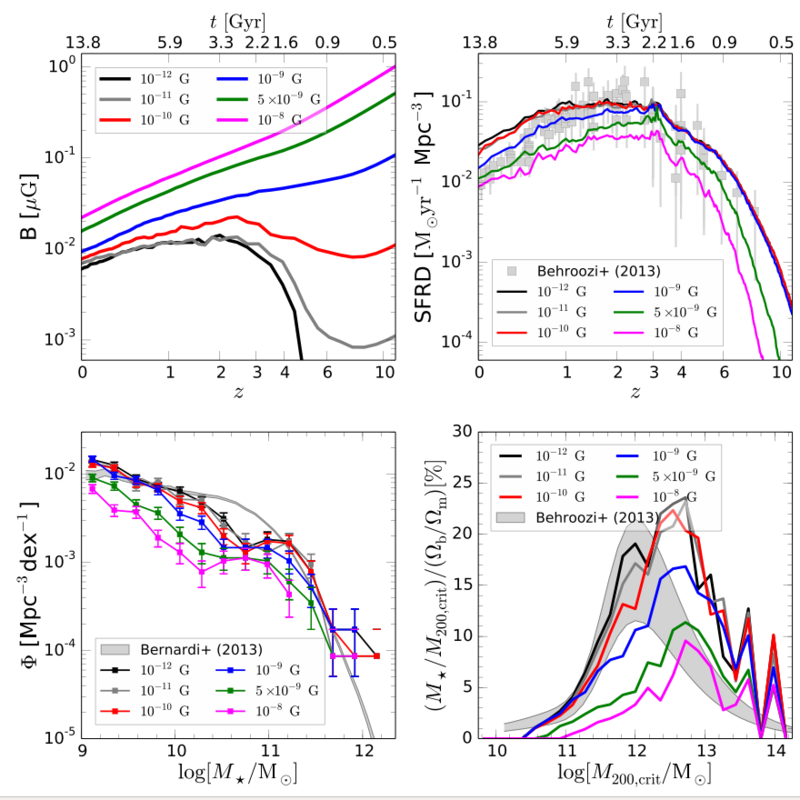 Using several cosmological simulations run with the AREPO code, the authors tested how various initial magnetic field strengths affected galaxy evolution and star formation over time. They used initial field strengths in the 10-8 – 10-9 G range discussed above, and both above and below this range. The top left panel of Figure 1 shows the evolution of the root mean square magnetic field in each of their simulations (the initial magnetic field strength is given in the legend next to the line colors), from the weakest (black) to the strongest (purple). In each of these panels, time is denoted by redshift, z, which reads from right to left (z = 0 is present day). The top left and top right plots only show redshifts z = 10 to z = 0, while the simulations begin at z = 127; this is why the magnetic field strengths on the right side of the graph are not the initial values. The remaining plots in this figure constitute the main results of this work. While there is a lot going on, lets take some time to digest it. In the top right of Figure 1, the authors show the star formation rate density (SFRD) in terms of solar masses per year in the entire simulation over time. This is compared to a collection of observations of our Universe (gray). As shown, stronger initial magnetic fields decrease the SFRD (less stars overall) at all times, with magnetic fields above 10-9 G producing the largest effect. This effect extends also to galaxies (lower left plot). This figure shows the number density of galaxies as a function of the total stellar mass of those galaxies. That is a rough sentence to swallow, but this plot can be thought of as a histogram of the number of galaxies in the simulation that contain a certain total mass of stars. The lower the line, the fewer galaxies there are at a certain mass. This decline is especially true for lower mass galaxies, while the effect is smaller for larger galaxies. The lower right plot shows the ratio of the galaxy stellar mass to total mass (stars + gas + dark matter) as a function of the total mass of the dark matter halo in which they reside. In each case, a stronger magnetic field means that a given dark matter halo contains less and less stars. As in the lower left plot, this effect is much more dramatic for the lower mass galaxies. All of these effects indicate that a stronger magnetic field provides enough additional gas pressure to prevent gas from cooling and collapsing, a necessary process to form both stars and galaxies, hampering the growth of galaxies. Today’s astrobite shows that magnetic fields can have a dramatic effect on galaxy evolution. This is important, as it can eventually help constrain what magnetic fields in the early Universe looked like, giving astronomers another tool to better understand a phenomena that is very challenging to observe.